You need this document if you are looking to transfer ownership of your property, and want U.S. law to apply to your transaction. 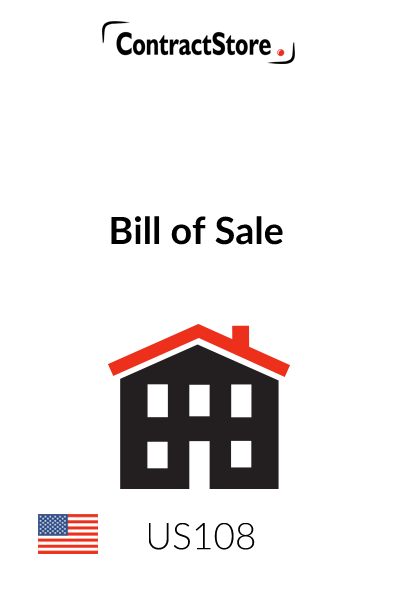 A bill of sale is a legal document that transfers ownership of personal property (“Property”) from one person, the transferor (“Assignor”), to another person, the transferee (“Assignee”). The form contained in this document can be signed either by individuals or by corporations or other entities. 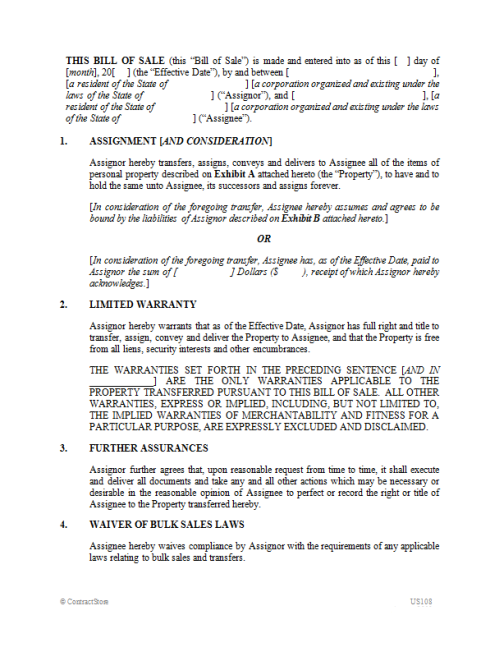 Under this form, Assignor conveys all of its interest in the Property to Assignee. Under the Uniform Commercial Code in force in most U.S. states, title to property normally passes upon delivery, unless the parties have agreed otherwise. 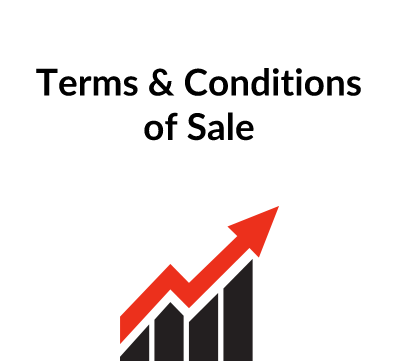 Accordingly, a bill of sale is not strictly legally necessary in most cases. However, it is common to use a bill of sale even if there has been physical delivery, as it serves as proof of title for sales tax purposes or upon use of the property as collateral or resale. A bill of sale cannot be used to transfer an interest in a car or other motor vehicle. For this purpose, it is necessary to complete a transfer form contained on the title document for the vehicle in question and file this with the department of motor vehicles in the appropriate state. Nor can a bill of sale be used for real property (such as land and buildings), but it can be used for personal property (such as furniture, equipment, animals or other personal property) located on real property. U.S. state laws do not make a formal distinction between absolute bills of sale and bills of sale given by way of security. Nor is there any statutorily prescribed form for a bill of sale or any formal or attestation requirement. It is common practice, however, to get the signatures of the parties notarized by a notary public, particularly if the bill of sale will be filed with any government filing office. This form provides a good starting point for preparing a first draft of a bill of sale. However, as with use of any form, it is very important to take the time to read the form in its entirety to ensure that it is customized appropriately for use in your individual situation. For all but the simplest of transactions, it can be anticipated that some customization will be in order; and as mentioned above, it may also be advisable to consult with competent legal counsel. 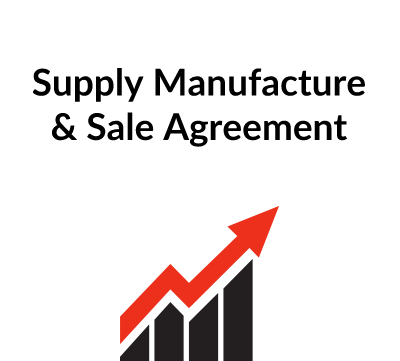 NOTE: In the interests of simplicity, this form omits a lot of the standard clauses that would be found in more extensive contracts for the sale of goods, such as warranties, indemnification, provisions relating to dispute resolution and standard “boilerplate” terms. If you are dealing with anything more than a simple transfer of a few simple items of personal property (for example, the sale of an entire business, or assets that are subject to liens or other restrictions that need to be released), then you are advised to examine the possibility of using more comprehensive documentation and, as appropriate, seek the assistance of competent legal counsel. As mentioned above, bills of sale need not be attested, but it is common practice to get the signatures of the parties notarized by a notary public. This is particularly true if the bill of sale will be filed with any government filing office, as this avoids the need later for formally proving the signatures. B – Assumed Liabilities – only if the second clause of paragraph 1 is used (see below). The first clause of paragraph 1 contains the basic language of transfer. The Property should be defined on Exhibit A. The second clause of paragraph 1 contains alternate optional language that could be used if Assignee is assuming liabilities of Assignor in full or partial consideration of the transfer, or if Assignee has paid a purchase price in consideration of the transfer. Either or both alternatives can be deleted if redundant. If the first option in this clause is left in, the Assumed Liabilities should be defined on Exhibit B. The first clause of paragraph 2 contains a limited warranty (as to right and title to convey). The second clause of paragraph 2 contains standard language excluding other (implied) warranties and special, indirect, incidental and consequential damages. The law in most states requires such exclusions to be “conspicuous”; in this form, they have been printed in all capital letters. Paragraph 3 contains a “further assurances” clause, requiring Assignee to perform other actions to perfect Assignor’s rights to the Property. Most states used to have in force bulk sales statutes that would provide protection to creditors in the context of the transfer of all of the transferor’s assets outside the ordinary course of business. These could potentially result in liability on the part of the transferee. Many of these statutes have been repealed, but paragraph 4 purports to waive the application of these statutes in states where they may remain in force. In U.S. contracts for the international sale of goods, the specific exclusion of the U.N. Convention on Contracts for the International Sale of Goods (the CISG) is common and reflects a typical bias in favor of applying U.S. sales laws over the laws imposed by an international treaty (the interpretation of which is often unclear). Note that unless it is specifically excluded, the CISG will apply to any sales contract where both parties are from countries that are signatories to the CISG. If a bill of sale is being used in a purely domestic setting, then the bracketed language relating to the CISG can be deleted.